Attending online colleges in Florida can be a smart option for many students. Florida has one of the strongest bodies of online students, and online colleges and universities. Some institutions are fully online, while others are more traditional universities with a physical campus that also offers online degrees. This guide gives a comprehensive look at the different options for online colleges in Florida, including statistics in areas such as tuition, rank, school type, graduation rate, and number of online programs available. The National Center for Education Statistics estimates that as of Fall 2012, 16.1% of Florida Title IV institutions were in fully online programs. Around 82% of these students were undergraduates and only 43% were Florida residents. Also, according to the Task Force on Postsecondary Online Education in Florida, 40% of students in Florida college and universities took at least one online course. The Baptist College of Florida is a Christian college found in Graceville, Florida. It makes sense, then, that most of its online programs focus on a variety of Christian majors – from a Master of Arts in Christian Studies to a Bachelor of Arts in Ministry. However, BCF also offers a number of other online programs if you’re not interested in religious studies. BCF offers an Associate of Arts in Music, a Bachelor of Arts in Business Leadership, a Bachelor of Arts in Elementary Education, and a Bachelor of Arts in Psychology among a number of non-religious degrees. Students at BCF are required to take the foundational curriculum, which includes 33 hours of general education classes and 18 hours of biblical and theological classes. BCF provides online students with a number of resources including access to the school’s online library resources, support services, and the ability to complete online courses at the time that works best for the student. Hobe Sound Bible College is a Christian University that offers degrees that are fully-online at the undergraduate level. Degree options include ministerial studies, counseling, and education. 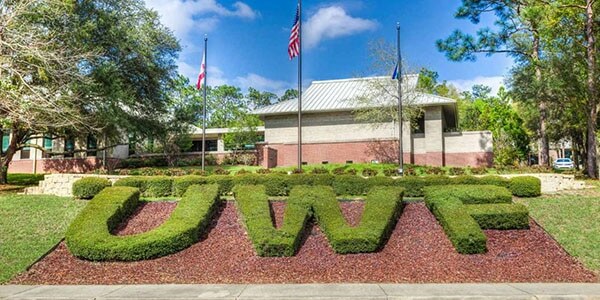 The University of West Florida offers online degrees at the undergraduate and graduate levels. Degrees are offered in multiple areas such as mathematics, maritime studies, health sciences, public health, and social sciences. At the university, students can choose from 50 different online programs. Students are given a research-centered education, with small classes sizes allowing individual attention and help. Distance learners are also paired with an academic coach to help navigate programs and other resources for completing a degree. The university is known for its exceptional student education and one of the lowest cost schools in Florida. Of its student body, 30% are enrolled completely online and still receive many benefits and help from the university. The University of Florida provides many completely online degrees for students at both the undergraduate and graduate level. The university is committed to finding solutions to challenges and helping the state’s economy flourish. Tuition rates are low for both on campus and online students, with financial assistance options available as well. The University offers 19 bachelor degree options to choose from including geology, sports management, and microbiology. UF provides students with the same privileges as other on-campus students, such as library and counseling services. Students can expect to achieve academic excellence through the University’s highly ranked programs. UF is home to over 150 research facilities and centers that promote innovation and development. Over 50 degrees are offered at the University of Central Florida at both the undergraduate and graduate level. Some of these may require some on-campus time. UCF offers 20 online degrees in several disciplines such as humanities, hospitality management, and education. There are also certificate options available for those interested in professional development. It is nationally recognized for creating the best online experience for undergraduate students. The writing center, online tutoring, library services and events are open to all students. Students are assigned a student success coach to help them throughout their college experience. The University of South Florida offers some Bachelor’s degree programs for transfer students in areas such as criminal justice and public health. They also offer some fully-online graduate programs. St. Petersburg College helps bring convenience and flexibility to all online learners. More than 650 courses are available online, taught by professors who are trained to teach virtually. Professors are available to online students through email, phone, or video conferencing. The college is committed to providing a rich learning environment that can also benefit the local community. Degrees topics include marketing, accounting, computer science and more. Its student body is active both online and on-campus creating opportunities for many students to benefit from including clubs, labs, and other platforms. Saint Leo University provides fully-online degrees from the associate’s to the master’s level. They offer programs in varied areas such as arts and sciences, social sciences, and business. The online programs are flexible, yet supportive with the adult learner in mind. An abundance of services is set in place for online learners such as student advising, peer mentoring, tutoring, and library resources. All online programs contain six start dates delivered in eight-week terms. The University is rooted in Catholic practices and shares its core values with all students. Florida International University offers several online degrees at the undergraduate level including degrees in finance, health services, and early childhood education. FIU also offers international learning opportunities as Miami’s only public research institution. With 27 online programs to choose from, students can find a subject that will help them work towards career centered goals. FIU gives its online students complete access to its resources and materials. Its degrees range from engineering to education also offering the most master’s degrees online in all of Florida. Veteran and military aide is also something that FIU strongly supports and provides educational benefits. Everglades University offers science focused degrees, such as aviation science and crisis and disaster management, at both the bachelor’s and master’s levels. The online professors are experienced in their related fields providing valuable knowledge and connections for the field. The online platform includes live chats, one-on-one instruction, and group discussions as well. Student services entail academic support, counseling, tutoring and more. Everglades is passionate about providing accessible education to adult learners and active duty members. Fields of study range from aviation science, business, human resources, and more. Based in Ocala, the College of Central Florida is a public state college with satellite locations in Lecanto and Chiefland. The Aspen Institute named CF one of the top 120 colleges in America for their quality education. The college serves more than 18,000 students. Like most colleges, CF uses Canvas as their learning management system. CF offers five online programs and 11 college credit certificates. Students can earn an Associate in Arts degree and transfer to a four-year school or they can earn an Associate in Science in any of the following concentrations: Business Administration, Early Childhood Education, Criminal Justice Technology, or Nursing. They can earn their college credit certificates in Business Administration- Business Specialist, Childhood Development – Early Intervention, Equine Technician, and many others. Established in 1948, Pensacola State College was the first public comprehensive community college on the Florida Panhandle. PSC aims to create a student-friendly environment on its various campuses located in Pensacola, Century, Milton, Warrington, and South Santa Rosa County. The school provides 14 different online programs for students who wish to take the online route. PSC also accepts approved transferrable credits into its online programs, making it possible to graduate in less than two years. PSC also provides certificate courses. Students can access the school’s online system completely on mobile and use Canvas for assignments, Spyglass to register for classes, and PirateMail to receive messages from the school, teachers, or students. In addition to offering an Associate in Arts in general studies for those who wish to transfer to a four-year university, PSC offers the following online programs: Accounting Technology, Accounting Technology Management, Business, Business Administration, Business Development and Entrepreneurship, Business Management, Criminal Justice, Criminal Justice Technology, Human Resource Administrator, Human Resource Management, Law Enforcement Administration, Nursing (RN to BSN), and Project Management. Nova Southeastern University offers students many fully-online certificates, as well as undergraduate and graduate degrees. Some of the degrees offered include computer science, health science, psychology, accounting, and nursing. The university is home to 24,000 students, many of which are enrolled in online programs. Its four fully online bachelor’s degrees are in psychology, health science, nursing, and business management. Its dedication to providing students with convenient methods of studying has led to the university being one of the top and best valued schools in Florida. NSU offers specialist training opportunities for those looking to progress in their current career. Professors use the learning management software Sharklearn for students to communicate with teachers, submit assignments, and access course content. Broward College offers fully-online associate and bachelor’s degrees, as well as technical certificates. Undergraduate degrees are offered in information technology, management, technology management, and nursing. Some of the degree programs can be completed in as little as 15 months. Uniquely, some programs do not require textbook costs to help students. Accelerated programs are an option depending upon the program to help students achieve their degree faster. The college serves over 62,000 students and continues to add and develop programs to cater to all types of students and their educational goals. From advisors to career consultants to tutors, Miami Dade College provides all the tools a student needs to succeed as a distance learner. Some online classes require midterms and finals to be proctored. However, through their use of Proctor U and remote proctoring services, students can have the required exam supervision without leaving home. MDC sets deadlines for assignments and tests, but otherwise, a student is free to arrange their schedule as much as they want. MDC’s Virtual College offers 14 different online programs. Students can choose from five different bachelor degree programs: Public Safety Management, Supervision and Management, Supply Chain Management, Information Systems Technology, and Nursing (RN to BSN). Students can also earn an Associate in Arts and, after completion, are guaranteed the opportunity to enroll in Florida’s state universities. Students can also choose from eight different Associate in Science degree programs, including Accounting Technology, Marketing Management, and Criminal Justice Technology among others. In addition, they also offer seven different online certificate programs. Adventist University of Health Sciences provides a bachelor’s degree in radiologic science and an RN in nursing. Residents living in Wisconsin, Indiana, Massachusetts, Iowa, and Minnesota are not eligible to apply to this University. Seminole State College of Florida offers 15 online degrees, as well as 29 certificate programs that can be completed entirely online. Students who decide to take the online path can find help through the eServices department, which provides electronic forms, academic plans, and registration documents for distance learners. All classes use the Canvas course management system. The Seminole State College Catalog provides important notes about classes for all students. Students can choose to complete General Education courses and graduate with an Associate in Arts degree. They offer five bachelor of science degrees online: Business and Information Management, Construction, Engineering Technology, Health Sciences and Information Systems Technology. The school offers nine Associate in Science degrees online, including Business Administration, Computer Programming and Analysis, Social Media and Marketing, as well as others. Daytona State College offers a number of undergraduate degrees in areas including; nursing, computer programming, and engineering technology. Certificate programs are also available for individuals to complete to progress in their career. The college has been providing online education since 1996 and continues to grow immensely. Currently, Daytona offers over 300 online courses for students to choose from. Its online website is easy to navigate and explore degree options and subjects to find out requirements and course load work. Students have options in undergraduate or graduate degrees at Florida State University but must have completed general education requirements first. Bachelor’s degrees are offered in areas such as public policy and criminology. Master’s level students have 15 degree options. Indian River State College offers two associate degree programs and two bachelor’s degree programs that are completely online. Bachelor’s degree options are offered in business, management, IT, nursing, public administration, and education. Its online learning management system, Blackboard, helps students access information, communication tools, submit assignments, etc. Indian River’s career center allows students to view job listings and develop their professional portfolio. The college focuses on educational, cultural, and career development among each student. Distance learning students have access to Smarthinking which helps students with homework, tutoring and writing assistance. Hodges University provides degrees in the medical, business, and legal fields. Degrees are offered at the undergraduate and graduate levels. Hodges offers accelerated online programs for students looking to complete a degree faster. The university has 30 degrees to choose from which focus on marketing, legal studies, psychology, and more. Financial aid is available to those who qualify as well as other scholarships through the university. Hodges realizes that many students have other commitments to tend to, and by providing affordable convenient education, students can progress in their desired career fields. Hillsborough Community College provides fully online and hybrid courses. Both types of classes have the same content, objectives, and transferability as traditional classes. These online (or partly online) classes are not self-paced; however, they do offer flexibility and convenience that traditional classes may not have. Students who are planning to take online classes should have the equipment necessary (computer, internet connection, etc.) to interact with their instructors and peers through discussion boards, blog posts, and have access to online publisher resources. HCC offers 10 online programs in addition to seven certificate programs. Some of the Associate in Arts degrees offered include Business Administration, Education/Teacher Preparation, and Psychology. HCC also offers four Associate in Science degrees: Business Administration, Criminology and Criminal Justice Studies, Optical Management Technology, and Fire Science Technology. Gulf Coast State College offers fully accredited online courses that allow individuals to earn an education working around work and family obligations. Students can work independently and learn to manage their time and priorities. Its online courses are taught through an interactive platform with video sessions. Certificates are also available to those looking to progress quickly in their career. Criminal justice, health sciences, and legal studies are popular degrees pursued by students at GCSC. Academic achievement is strived for at Gulf Coast, including many resources to help students succeed. Florida Atlantic University provides online students with a variety of degree plans and subjects to pursue. FAU welcomes all students offering more than 180 programs. Degree programs are available in the colleges of business, education, nursing, geosciences, engineering and computer science. Online courses are presented through Blackboard, which helps connect online students with their peers and teachers. The university is home to 30,000 students all enrolled in a range of disciplines. It’s well ranked online programs can be attributed to its professors who undergo extensive training to teach in the online community. Geography, nursing, and computer science are popular degrees that FAU offers. Students who enroll in online classes use the Canvas Learning ManagementSystem, which allows them to interact with instructors and peers in both online and traditional classes. According to Vikki Milton, Chipola’s Director of eLearning, “to ensure that [Chipola’s] online classes have the same high standards as traditional classes, [Chipola] faculty are required to meet proficiency standards. Online courses also are proctored to confirm that a student’s work is their own.” These proctored exams will take place at the school’s testing center or at an otherwise approved location, even for online students. Southeastern University is a private Christian school that offers multiple fully-online degree programs at both the undergraduate and graduate levels. Some of the options include; psychology, criminal justice, human services, education, and divinity. Community college students in Florida have some interesting perks. Thanks to Florida’s Statewide Articulation Agreement, as long as they complete their associate degree, they have guaranteed admission to one of the 11 state universities. Couple that path to a four-year education with North Florida Community College’s affordability and you have one of the best community colleges in the state. In 2016, NFCC awarded $230,000 in scholarships and grants and has one of the lowest net tuition prices in the state. NFCC is mostly known as a commuter school. At the moment, the college doesn’t offer full online programs or certificates. However, the school offers a number of online courses for their certificate and associate degree programs thanks to Ed2Go. If you don’t mind taking some classes in a traditional college setting alongside your online classes if it means paying less and having a guaranteed acceptance into a state school, then North Florida Community College might be the place for you. UNF provides a variety of degrees at the undergraduate and graduate levels including postgraduate courses in American Sign Language. Warner University offers several degree programs including healthcare administration, transformational Christian ministry, business administration and educational studies, but these are only available to transfer students who already have at least 45 credits. Warner University is based on five core values: service, integrity, knowledge, wisdom, and growth. These values are evident in its curriculum and student endeavors to promote a unique learning experience. WU has a generous transfer credit policy to help students graduate faster using previous credits and experience. The university also supports military and veteran personnel with additional benefits to help them receive an education as well. With low tuition and a high student success rate, Tallahassee Community College is a great choice for those looking to further their education. TCC has over 600 courses and has a number of options for how they can be taken – from traditional face-to-face classes to fully online and hybrid classes, TCC has plenty to offer. TCC Online aims to help students succeed in the work industry by delivering high-quality classes. Besides offering a variety of online classes, TCC offers four in-demand degree programs online. If you’re planning on transferring to a public four-year university, get the Associate in Arts degree TCC has to offer. Otherwise, you can get an Associate in Science fully online in any of the following concentrations: Criminal Justice Technology, Early Childhood Development and Education, and Paralegal and Legal Studies. Palm Beach State College offers a Bachelor of Science in nursing or applied science. Palm Beach Atlantic offers three online bachelor’s programs and one online master’s program. The undergraduate options are in ministry, organizational management, and psychology. The master’s program is in leadership. The university’s online programs are designed to be accessible and flexible. As a Christian University PBAU serves 2,500 students emphasizing leadership and service. Class sizes are small, which allows students to fully access help and information from professors. Palm Beach is dedicated to its students and provides support and encouragement throughout their academic programs. The office of online learning at PBAU provides connections, trainings, resources, and more for students. Its online courses incorporate Christian values and offer ministry teachings to study. Multiple fully-online degrees are offered at Florida Institute of Technology from the associate to master’s levels. Some of the degrees offered include; psychology, liberal arts, business, criminal justice, and computer information systems. Florida Gulf Coast University offers programs at both the baccalaureate and graduate levels. Undergraduate options include criminal justice and health sciences. Graduate level options include business and public administration. Florida Agricultural and Mechanical University uses a number of tools, such as the Blackboard course management system and video conferencing, to provide online graduate students with everything they need to complete their degrees. Florida A&M University also provides troubleshooting and technical assistance through the Office of Instructional Technology. The school offers three graduate degrees online: Master of Business Administration, Master of Public Health, and Master of Science in Nursing. Florida A&M University also has a range of partnerships which its MBA students can use to gain exposure to leaders and opportunities in the business field. Embry – Riddle Aeronautical University – Worldwide offers multiple degrees fully online from the associate to the master’s level. These specialty degrees cover areas including; aerospace, aviation, fire science, and technical management. Lynn University online students can choose from multiple undergraduate and graduate programs including composition, aviation management, and drama. 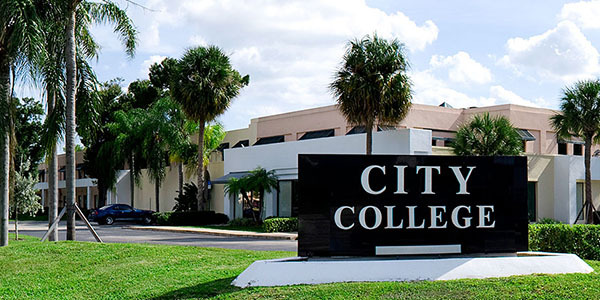 City College, Fort Lauderdale offers three online bachelor’s degrees in healthcare administration, nursing, and management. 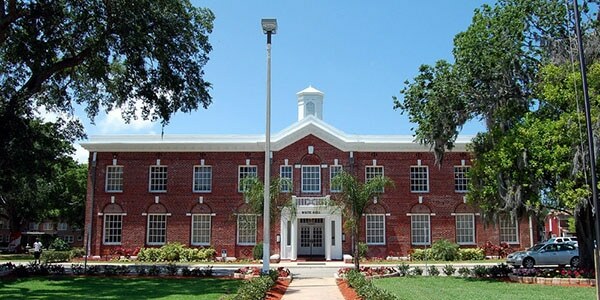 Originally established as DeLand Academy in 1883 by a New York philanthropist known as Henry Addison DeLand, Stetson University is a private, not-for-profit university with its main campus located in DeLand. The university also has a campus in Gulfport and operates two satellite centers: the Tampa Law Center in Tampa and the Stetson University Center in Celebration. Stetson is organized into four different schools and colleges: the College of Arts and Sciences, the School of Music, the School of Business Administration, and the College of Law. They offer two fully online degree programs: Master of Accountancy and a Bachelor of Arts in Organizational Leadership. Students can also take advantage of the Online Summer Study program. Webber International University offers degree options at the AA, BS, and MBA levels. Some of the options include computer information systems, business, and sports business management. Barry University offers fully-online bachelor’s degrees in administration and emergency management. Master’s degrees are available in public administration. Barry University, a liberal arts Catholic institution, has been providing quality online education to all students who seek a convenient and affordable way of learning. Barry University is known for its healthcare administration degree program among many others. The university is known for its commitment to knowledge, truth, and social justice. Designed with working adults in mind, the curriculum and course structure is flexible and the online portal has many tools and resources to help students succeed. Both on campus and online Barry has created an inclusive environment that its students thrive in. The university’s accreditation is from Southern Association of Colleges and Schools. Bethune-Cookman University is a private Methodist associated college that offers two online degree programs. Jacksonville University offers one fully-online degree program for RN’s looking to earn their Bachelor of Science. Trinity College of Florida is a four-year degree Bible college that offers three online degree programs. The criteria to determine which online colleges are the best takes into consideration a number of factors, including number of online programs, graduation rate, and tuition cost. For more information, visit our detailed methodology page. Note: Tuition amounts do not include mandatory fees or any other fees the school might charge. If you’re looking for financial aid, we recently created a financial aid guide for our students. All students can fill out the Free Application for Student Aid( FAFSA) to begin the process of receiving funding from the federal government. In 2012, 70% of Florida students received at least some federal financial aid. Individual colleges and universities also have their own scholarship and financial aid opportunities and guidelines, be sure to check with the school you plan to attend on their policies and opportunities.